The roulette wheel is a marvel of random engineering. The wheel is basically large bowl, nearly three feet in diameter, with slightly slanted walls. The wheel itself weighs about a hundred pounds. The surface of the roulette wheel's walls is separated into 37 or 38 internal compartments, known as "pockets". Each pocket is just large enough to hold the spinning marble once it comes to rest. The pockets are alternately colored red and black and are numbered 1 thru 36. The exceptions to this are the zero pockets, which are colored green. The numbers on a roulette wheel are not in sequence nor are they placed completely randomly. The numbers are ordered to achieve the optimum balance between red and black, high and low, and odd and even. If you take a look at a roulette wheel you will see that located directly across from each odd number is the next highest even number. Pairs of even numbers alternate with pairs of odd numbers. There is a variation to this scheme around the zero pockets. 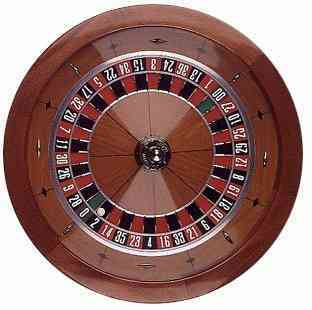 There are two major types of roulette wheel, the American roulette wheel and the European roulette wheel. The only significant deference between the two designs is the fact that the American wheel has two zero pockets, single zero (0) and double zero (00). The European wheel only has the single zero pocket. This small difference results in a large difference in the house edge. On a European roulette wheel the house edge is approximately 2.70%, much lower than the American wheel where the house edge is 5.26%. Nevertheless, online roulette has its overall advantage as the time for the spinning and engaging of the roulette wheel is substantial reduced, allowing one to play more bets in a shorter time span.